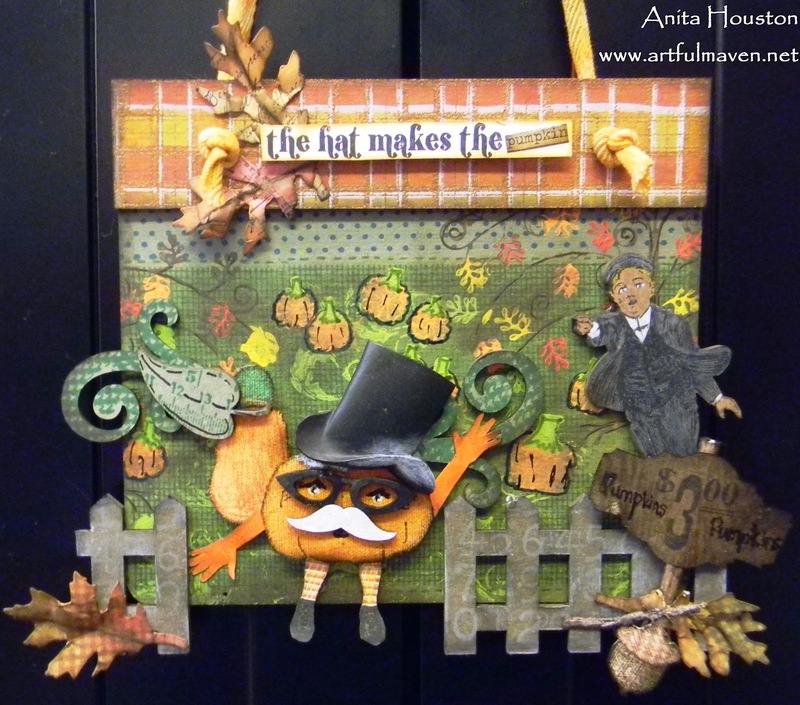 The Artful Maven: The Hat Makes The Pumpkin! Before I get started, I have some major thanks to send out. First, I send out the biggest thanks possible to Mr. Tim Holtz after honoring me with a little blog recognition. WOW!!! I really have no words to give this justice properly, but it meant the world to me. Thank you truly Tim! WOW!!! Second, even more accolades to all of you fantastic regulars for all the emails and comments about this, as well as get well wishes (Yay for antibiotics, but still not 100%..ugh!). Again, no words good enough! Lastly, thank you to all the new peeps who decided to visit and/or follow me after Tim's post! I am overwhelmed, and my cup runneth over!!! You all are awesome! I hope you visited the other blogs listed as well...all fantastic, and two I didn't know about and now follow myself! There is loads of inspiration to be found from every single one! The same kind of inspiration I get when I visit all of your blogs as well! That is the beauty of all of this...the sharing! There is so much talent out there in blog land...more than I could ever hope to have, and I am so happy you all share it with me! Thank you! Okay, enough with the mushy words! Let's talk Art! 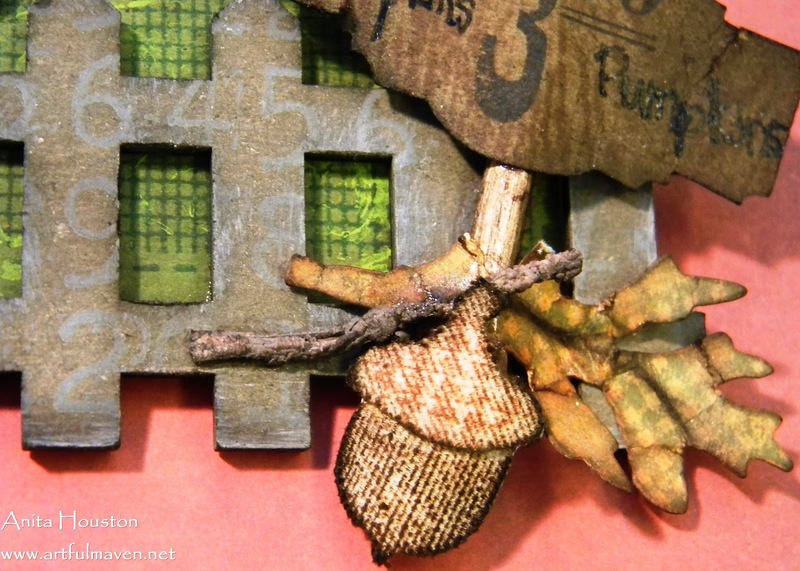 Did you see Wendy's fantastic 3D Sticky Back Acorn Tag on the Ranger Blog the other day? Her Clearly For Art is on the back of Claudine's Sticky Back Canvas, and that is what our new Making Art Challenge is based on at the Everything Wendy Vecchi Yahoo Group this time. Of course I had to add lots of Art Parts! They are my favorite Wendy treat...uh I mean product! So I am submitting this to Simon Says Stamp & Show's challenge of "Favorites". 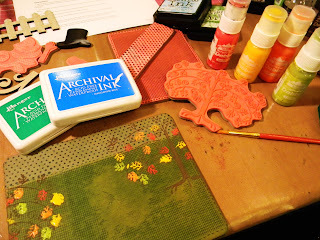 Stamping with Archival Inks and Paint Dabbers using lots of Wendy stamps, transformed this Art Part base. More stamping with Paint Dabbers, and this time with a few Tim stamps. I also stamped Wendy's light bulb in StazOn Orange onto Sticky Back Canvas cover Clearly For Art. 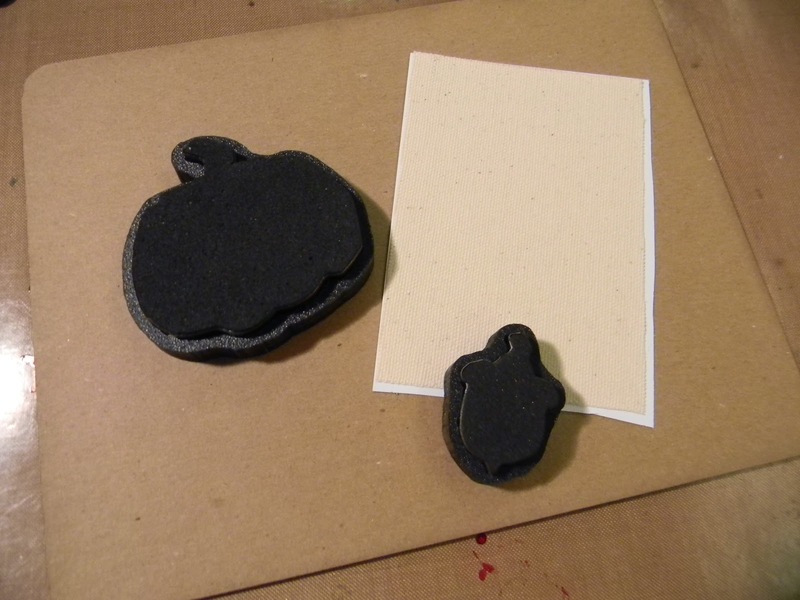 I inked it with Distress Inks and then heat the CFA to shape it. That light bulb makes the perfect oblong pumpkin! 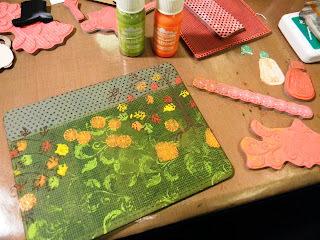 Glaze pens highlighted the pumpkin patch. 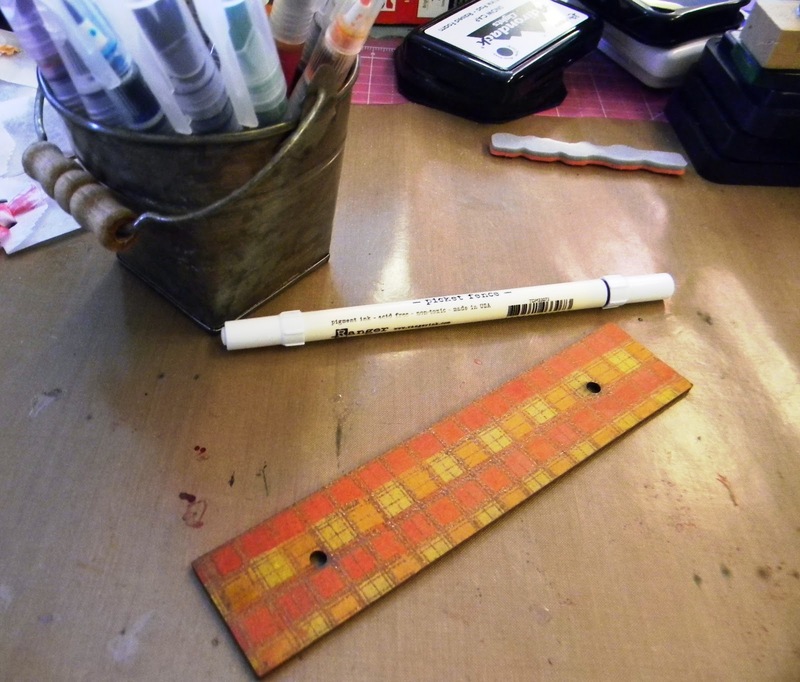 I heat embossed the plaid image and then added color using Dyan's Dylusions Ink Sprays and a white Distress Marker. I stamped Wendy's numbers on the fence Art Part using Snow Cap Pigment Ink. I inked over that with Walnut Distress Ink, and then wiped off the Walnut from the Snow Cap. It acts as a resist...a technique Wendy teaches. I stamped the boy on his coordinating Art Part and colored him in with Distress Markers. I don't have stamps for these, do I just diecut Tim's Sizzix Mini Pumpkin and Acorns onto canvas covered CFA, inked and stamped a few designs on them, and then heat to shape them. Blossom Buckets adorned Mr. 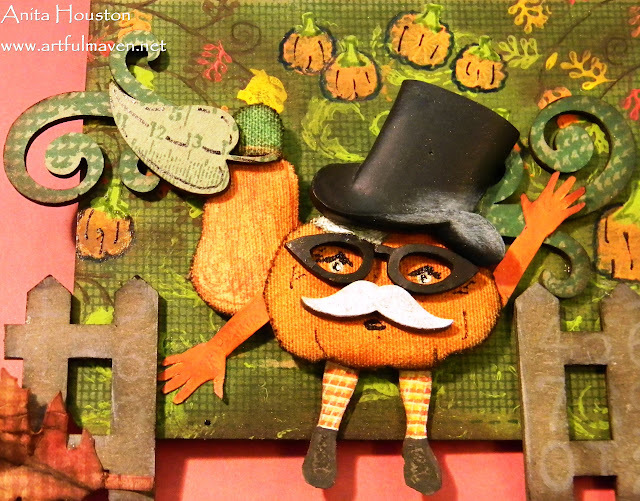 Wise Ol' Pumpkin, along with a distinguished mustache Art Part, and of course some hands and legs. He wants out of there!!!! Who wants to be carved up? 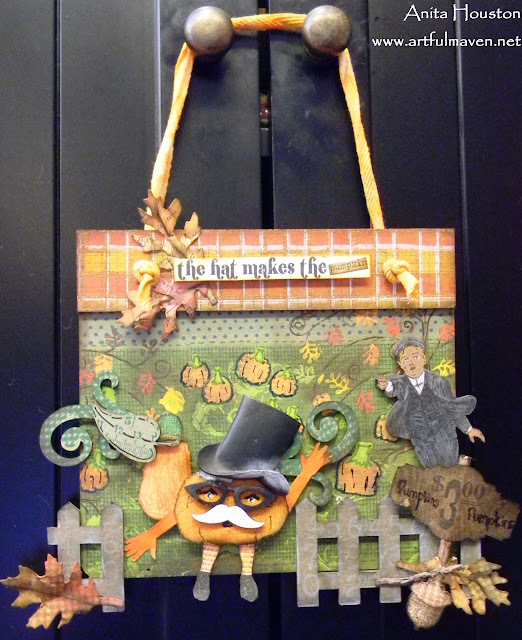 Another Sizzix Mini, Tim's wood grain image and Wendy's money money money image, along with some Distress Ink made for the sign! The sentiment was stamped on Ranger's Specialty Stamping Paper, and finished with Distress Ink and Tim's Seasonal Chit Chat Stickers. Twigs and leaves given to me by Linda at The Funkie Junkie Boutique in my last order gussied up the plaque. It was finished with twill that was colored with Ranger's Color Wash, Perfect Pearls Mist, and a little Antiqued Bronze Distress Stain. I am also submitting this to Unruly Paper Arts Reader Art Quest 1 for "Paint". First off as I already congratulated you, so glad you are feeling better!! Not this piece gave me such a smile! Totally adorable and love all the 3-D goodness! Major cuteness here! Its a fun holiday piece. Congrats on the Tim goodness!! It's so wonderful when he recognizes you and your blog. How wonderful!!! Also, I really am glad your feeling better. Despite your not feeling well you managed to create a wonderful piece of cuteness!! 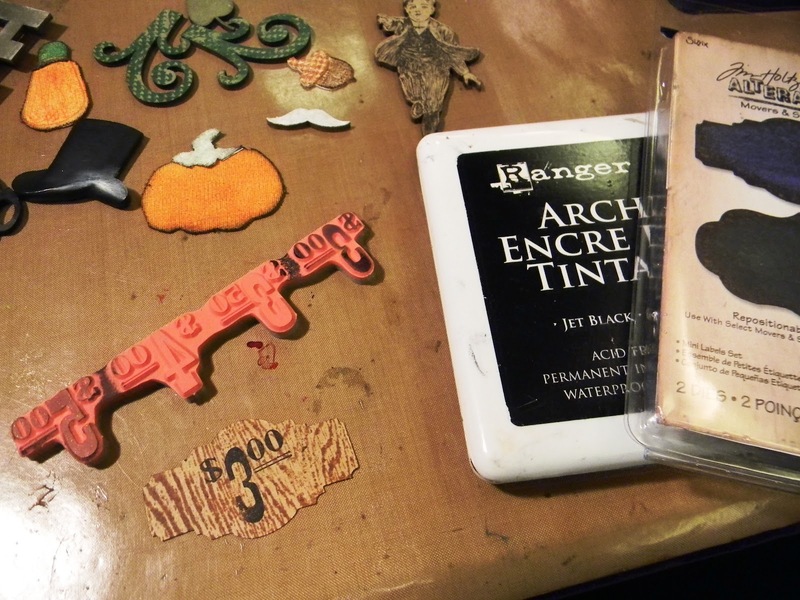 This is amazing, I love the little acorn and pumpkin, who would have known you didn't have those stamps? It's simply dahhrr-lling!! 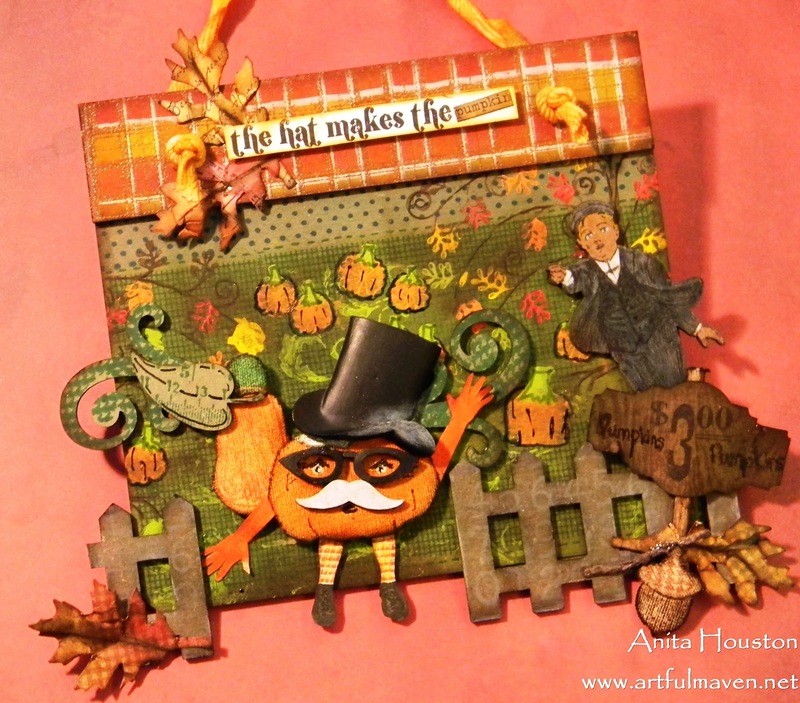 Congratulations on being mentioned on Tim's blog - well deserved :) Your hanging looks fantastic, I love the dressed pumpkin. A wonderfully fun and detailed project! Love it! Yes, I saw your name on Tim's list and gave a little cheer! So deserving! Good for you. This piece is simply delightful. 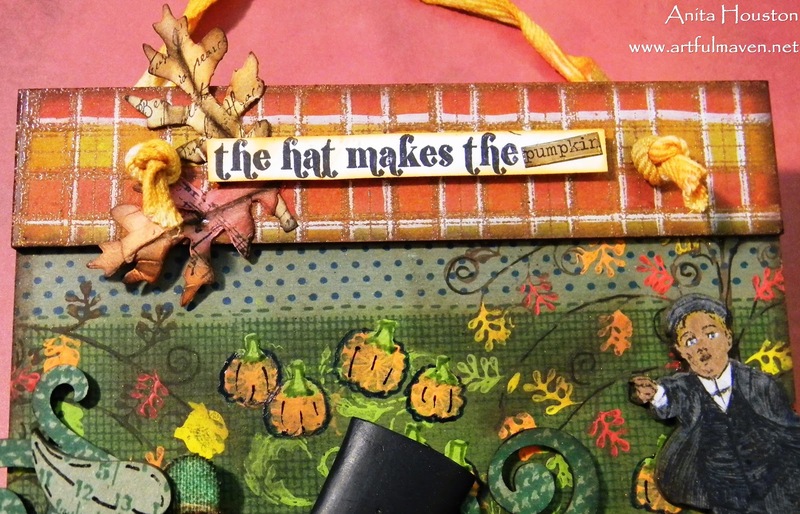 I love the mosaic look of the top border, and all those yummy stamped pumpkins. But the pumpkin "man" is off the hook! Fun, fun, fun! You just ooze talent, girl! I love it! Congrats on being featured on TH's blog...the man knows his art :) Absolutely love this project. 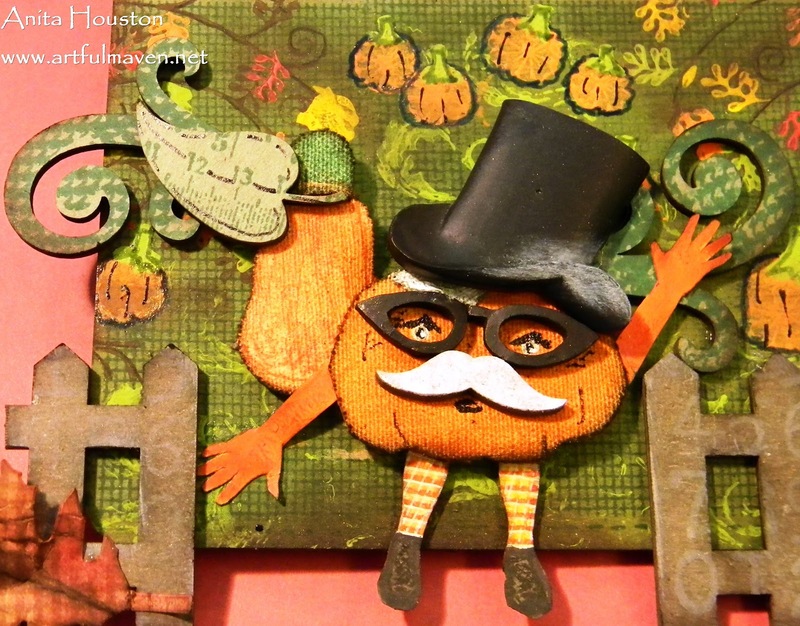 Mr. Pumpkin is amazing and certainly demonstrates that the sentiment is correct. 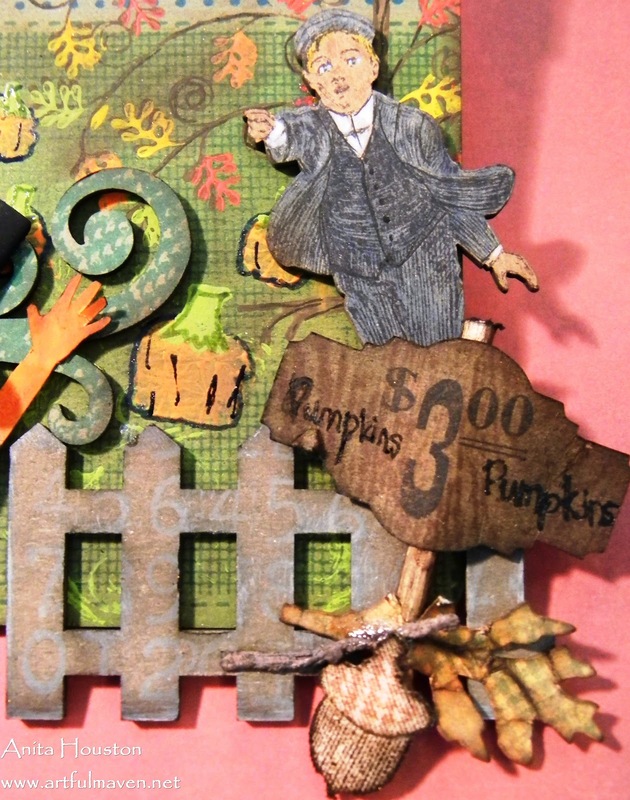 The whole scene with the newsboy and the fence just makes me smile. Glad to hear you are on the mend. I was getting worried when you weren't posting. Hi Anita, I wasn't surprised that you were spotlighted on Tim's blog...only surprised that it hadn't happened sooner! You are über-talented and deserve all of the recognition that it brought. This piece you have created here is LOL super cute! 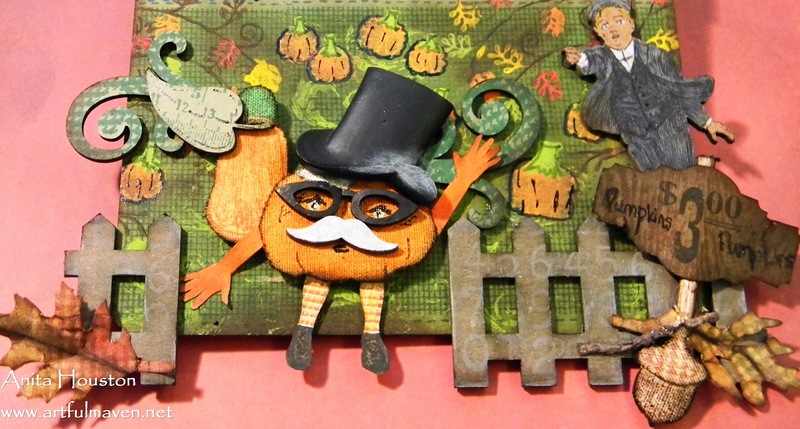 I just love the little pumpkin man making his escape from the pumpkin patch! The colors are great and you included so many details! It's awesome. This is sooooooooooooooo fun!!!! and very cool!!!!!!!!!!!!!!!!!!!!!!! This is so cool and fun Anita! Big congrats on being mentioned on Tim's blog, it must be such a thrill for you!! YEAH! Also, thanks so much for being a loyal participant of the MAC's, and the EWV group! I really appreciate it! This is amazing Anita. I love the layout/technique and that cute pumpkin. Another fabulous piece, Anita. Love all the color on this one. So much to look at! That sure is the cutest pumpkin I ever have seen! Love this fun and funky piece, and kudos again on the link from Tim. You rock!! Congratulations Anita! Love your project...just fabulous. Congrats Anita! This screams FUN!!!!! Love to see your creative/technique process!! Congratulation Anita! Wow it is so beautiful I love all this gorgerous elements. Mr pumpkin is so handsom so great idea. this is SERIOUS eye candy!